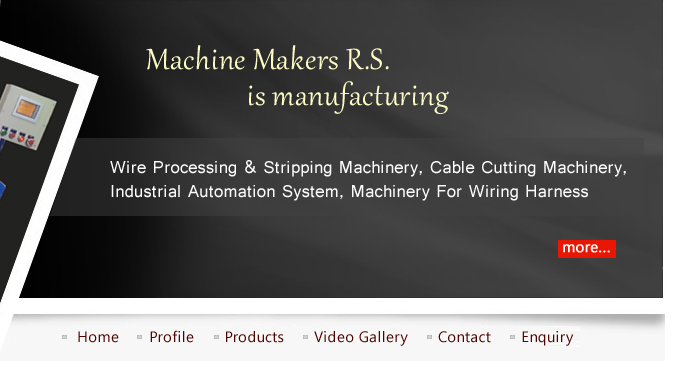 We are making machines mainly for wiring harness industry. But we design & manufacture special purpose automatic machines for various assembly operations. We have a manufacturing base near Mumbai in Western India. We also have a strong service support presence in northern India with hub at Delhi. Service support can also be extended in South India. Our service personnel are capable of installing and commissioning machines. They can also provide on the job training to the customer personnel. · Machine commissioning, installation and training to the overseas manufacturers. For mechanical design, we have solid-edge software. We can do marketing in Western, Northern and Southern India. We can service machines having pneumatics, PLC control, electrical/electronic panels, AC servo drives and VFD. After getting basic training for our key persons, we can ourselves train our other team members. With our experience and knowledge of local conditions, we can handle training and commissioning of machines. We will be comfortable to service table top and small machines. Our capabilities can be documented to interested parties.